I borrowed this from Game Informer. They won't mind. Retailer GameStop tells old Duke Nukem Forever pre-order holdouts: "Your money is still good here!" Anyone who's been holding the pre-order torch for Duke Nukem Forever back in the day is in luck – your pre-orders are still valid after all these years. 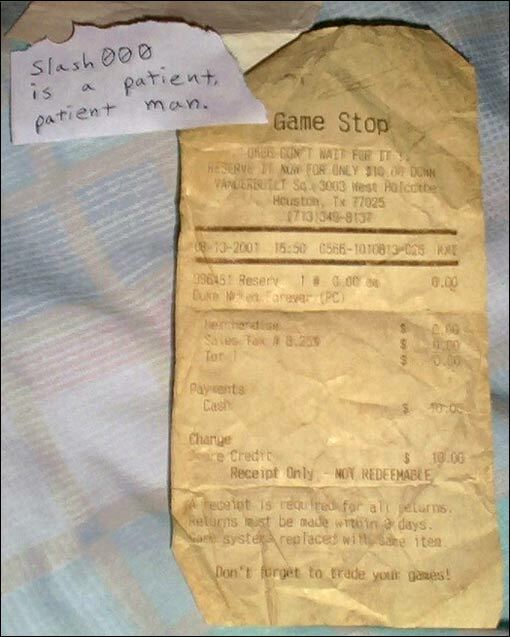 Of course, we hope you saved your receipt, as GameStop clerks aren't just going to take your word on it. In a statement posted by IGN, the company said: "With a long-anticipated release like Duke Nukem Forever, we encourage customers who pre-ordered more than a year ago to verify their reservation with their local store prior to launch. Provided the customer has a receipt, we will honor even those pre-orders taken long ago." Old school pre-orders will even get Duke's Big Package, the pre-order bonus that features Big Head mode, in-game t-shirts, and other extras. Start digging through your desk. That receipt has to be in there somewhere. Speaking of hunting out receipts. Did you ever see this one from Game Stop? - it's from 2001!! Slash000 is indeed a patient man! Slash00, where ever you, I hope you get your game. Bless. Didn't Pre order 10 years ago? Order DNF at Amazon now .